The glittering Ducale di Venezia, the Doge’s Palace, looks out toward the Venetian Lagoon on one side and St. Mark’s Square on the other. It was the residence of the powerful elected ruler of the Republic of Venice, and in this expertly guided tour, you’ll experience some of the Palace’s secrets while you follow in the footsteps of the most important – and some of the most infamous – leaders of Venice. Participate in the Doge’s Palace Secret Itineraries tour and explore hidden corners, camouflaged doors, and concealed passageways. Get privileged insights into the private rooms in the palace like the Office of the Doge’s Secretary, the rooms of the Deputy of the Secret Works of the Council of Ten, the Office of the Grand Chancellor, and the Secret Chancellery. In this city where masks, illusion, and subterfuge dominated both politics and personal life, you’ll experience secrets not normally accessible to the visiting public. 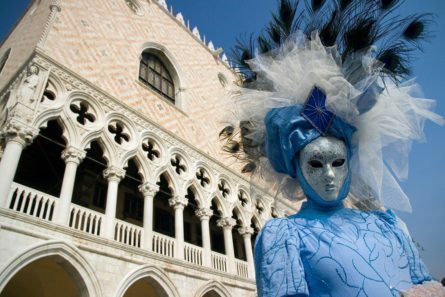 Then after this impressive tour, you’ll visit a Venetian mask-maker and create your own identity-hiding mask. If you could start anew on an anonymous Venice night, who would you be? A minimum of 2 people is required for the Secret Tour, the maximum is 25 people. The specifics of the Secret Tour may change slightly depending on circumstances.